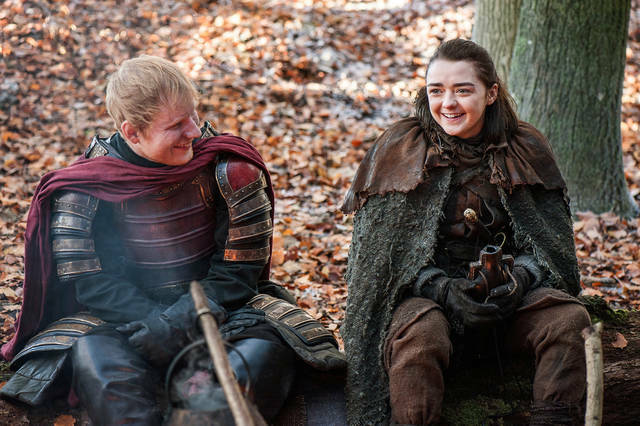 This image released by HBO shows Ed Sheeran, left, and Maisie Williams in a scene from “Game of Thrones.” Sheeran appeared as a Lannister soldier leading a group in song in the season premiere of the hit HBO fantasy drama, which debuted on the premium cable channel Sunday night. Ed Sheeran is basking in the aftermath of his “Game of Thrones” cameo. Sheeran appeared as a Lannister soldier leading a group in song in the season premiere of the hit HBO fantasy drama, which debuted on the premium cable channel Sunday night. The 26-year-old British singer posted a shot of himself on screen on Instagram Sunday with the caption, “Throwback to the time I was a Lannister.” He also posted a picture of himself on set alongside Maisie Williams, who plays Arya Stark. Producer David Benioff said in March that they had been trying to get Sheeran a spot on the show for years to surprise Williams, who’s a Sheeran superfan. Flatiron Books, which acquired the book in April, announced Monday that the former vice president will promote the book as part of his “American Promise Tour.” Two days before the book is released, an interview with Oprah Winfrey will air on Winfrey’s OWN network. His tour opens Nov. 13 with an appearance at Lincoln Center in Manhattan. Biden’s book centers on 2015, when his son Beau died and he decided not to run for president even though he believed he could win. OKLAHOMA CITY — Garth Brooks says he’ll pony up for a Hawaiian honeymoon for a couple who got engaged at his concert in Oklahoma City. WFAA-TV reports Drew Bargsley proposed to Chelsea Townsend while Brooks was playing his hit “Unanswered Prayers” Saturday night. The singer got wind of the commotion and asked the couple about their honeymoon plans from the stage. He told them he and his wife, Trisha Yearwood, will pay for their honeymoon if they decide to go to Hawaii. WICHITA, Kan. — The deteriorating log cabin at the “Little House on the Prairie” site in Kansas is expected to soon get a makeover. The Wichita Eagle reports that the current cabin was re-created and built near Independence in 1977 at the television series’ peak of popularity. The show is based off Laura Ingalls Wilder’s books centered on her childhood in the country’s Midwest region. Wilder spent a year with her family at the Kansas site in 1869. Cabin owners Bill Kurtis and Jean Schodorf say that four decades of weather has worn down the house. They want to rebuild the house as well as add a barn. Schodorf says more than 20,000 people visit the site each year. She says the cabin is scheduled for construction in October and November. Phillippe wrote in the caption of his Instagram post Monday that he’s “going to be ok.” The picture shows him with a bandage on his leg and a swollen foot. He later explained on Twitter that he broke his leg during a family outing Sunday and it required “surgical attention,” but he will make a full recovery. The 42-year-old thanked first responders and paramedics for their help. Phillippe responded to fan speculation that he hurt himself doing a stunt for his USA series “Shooter,” saying he wasn’t anywhere near the set.